Institute of Quantum Optics and Quantum Information (IQOQI), Austrian Academy of Sciences, Innsbruck, Austria. In 1970, the Russian physicist Vitaly Efimov made a prediction that today represents one of the most bizarre and fascinating results of quantum mechanics . In the context of nuclear physics, he considered the elementary situation of three bosons with pairwise interactions near a scattering resonance. He found an infinite ladder of three-body bound states, even existing under conditions where the interaction is too weak to support two-bound bound states. Until 2006, these Efimov trimer states have remained a theoretical curiosity without any experimental confirmation. Then the situation changed with the first observations in ultracold atomic systems, and Efimov’s scenario turned into a hot topic with many experimental investigations . Inherent to Efimov’s scenario is a discrete scaling law, expressing the self-similarity of all these trimer states. Discrete scaling means that, if a three-body state exists, then another state must also exist, being just a factor of 22.7 larger. Similarly the binding energy is by factor 22.72 smaller. This leads to an infinite series of states, as illustrated in Fig. 1. In practice, by the usual standards of molecular physics, already the first state is a very large quantum object (a so-called “halo state”), as it is a hundred times larger than conventional trimers and it is extremely weakly bound. In our earlier experiments on cesium atoms , we found the first Efimov state with a size of roughly 50 nm. The second state in the series, also referred to as the first excited Efimov trimer, is expected to be 22.7 larger and about 500 times more weakly bound than the lowest Efimov state. This makes it an extreme molecular quantum object, 1 µm in size and exceptionally weakly bound. Fig. 1: Efimov’s scenario for three interacting particles. 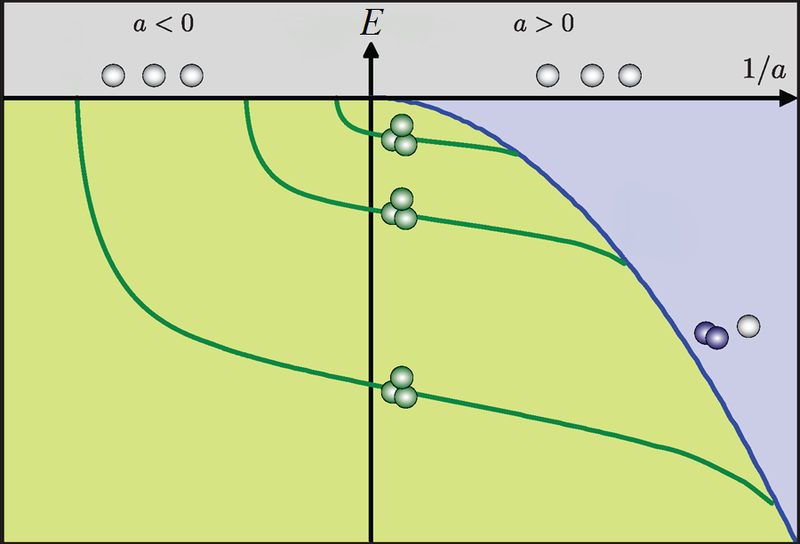 The energy of the Efimov states (green solid lines) is plotted versus the inverse scattering length. In the grey-shaded region (E>0), the system consists of unbound atoms. In the blue-shaded region, atoms coexist with dimers. In the green-shaded region, the trimer states occur. For illustration purposes, the discrete scaling factor is artificially reduced from 22.7 to 2. In our experiments, an ultracold atomic gas of cesium atoms is prepared by methods of laser cooling and subsequent evaporative cooling. The ensemble of a few ten thousand atoms is then kept by the weak attractive forces of an infrared laser beam in a volume of about 50µm diameter. They atoms collide with each other in the trap and the ensemble is observed over a few seconds. A key feature is the possibility to tune the quantum-mechanical interaction between pairs of atoms in a well-controlled way. Experimentalists take advantage of so-called Feshbach resonances , which arise as a consequence of the coupling of two colliding atoms to a molecular state. The collision sensitively depends on a magnetic field and -- at specific field strengths -- resonances occur. Very accurate knowledge of these resonances is an essential prerequisite for the experiments. The experimental signature of the formation of an Efimov state is the loss of atoms from the trap . At specific magnetic fields, loss is observed to be much faster than usual. This marks the situation when three atoms couple to an Efimov state. The Efimov state here is an object that can live for a few milliseconds, before it undergoes a fragmentation into a deeply bound molecule and a free atom, with the energetic fragments leaving the trap. For observing the excited Efimov trimer  we were confronted with three major challenges: (1) We needed an extremely cold gas, colder than everything else we had prepared in our lab before. We extended our previous methods with an additional stage, where we expanded the ultracold ample into an ultraweak electromagnetic trap made of a combination of magnetic and optical fields. In this way we reached a temperature as low as 7 nK. (2) We had to control the interaction properties near a resonance at an unprecedented accuracy level. Here we benefitted from the special properties of cesium and our long-standing expertise with this particular species . (3) We had to understand the role of the finite temperatures in our sample, as even the 7nK reached is a relatively high temperature on the energy scale of the excited Efimov state. Thanks to a theoretical model developed by a group at the École Normale Supérieure, Paris , this was finally possible. We show the main result of our experiments in Fig. 2. The loss of atoms out of the trap is quantified by a rate coefficient L3, which is plotted as a function of the inverse scattering length 1/a. In the center, where 1/a is zero, the strongest interaction is realized. The strongest loss does not occur there, but somewhat shifted away from this center. From a detailed analysis of this peak we could obtain the exact position where the Efimov state couples to three atoms colliding in the limit of zero energy. It appears when the scattering length has a value 20000(000) larger than Bohr’s radius (size of a hydrogen atom in the ground state). This result also characterizes the size of the Efimov state. Fig. 2: The resonance that results from the excited Efimov state. The loss rate coefficient L3 is plotted as a function of the inverse scattering length. Two data sets have been recorded under similar conditions (sets A and B). The vertical dashed line indicates the expected position in the limit of zero temperature. The resonance is slightly upshifted because of the finite temperature of the sample. The solid line is a theoretical prediction based on the properties of the ground-state Efimov resonance, characterized in earlier work, with the grey-shaded region indicating the uncertainty range. We can finally compare our observation for the first excited Efimov state to earlier measurements on the Efimov ground state in the same system . The final result is that the second state is by a factor of 21.0 (with an uncertainty of ±1.3) larger than the first Efimov state. With some probability this result may still be consistent with the ideal factor of 22.7. However, we believe that the small deviation is due to the fact that the lowest Efimov state deviates somewhat from Efimov’s idealized case. This is theoretically expected, but not fully understood. This exactly points to the intriguing question: How Efimov states appear in real systems and in how far the ideal scenario holds predictive power to describe the real situation. Many theoretical and experimental investigations currently pursue research along these lines. The Efimov scenario is a paradigm for few-body physics, and it is just a tip of an iceberg of many more phenomena related to a few interacting particles in the quantum world. Many more phenomena will be discovered (see Ref. for a recent example from the world of fermions). A particularly interesting question is how few-body interactions will affect the properties of macroscopic many-body quantum states, like in new superconducting materials. Bo Huang (graduate student) and Leonid Sidorenkov (postdoctoral researcher) carried out the work in the laboratory of the author at the University of Innsbruck. Theoretical support came from Jeremy M. Hutson, professor of physics and chemistry at the Univ. of Durham, United Kingdom. The experiment was funded by the Austrian Science Fund FWF. 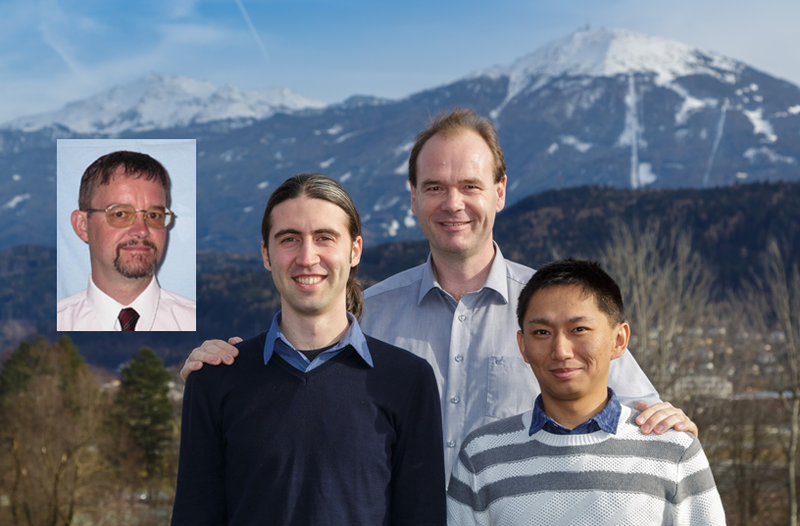 The team: The main picture (photo M. Knabl/IQOQI) shows the experimental team Leonid Sidorenkov, Rudolf Grimm and Bo Huang on the background of the mountains Patscherkofel (right) and Glungezer (left) near Innsbruck, Austria. The inset shows Jeremy M. Hutson from the University of Durham, United Kingdom. V. Efimov, "Energy levels arising from resonant two-body forces in a three-body system". Physics Letters B, 33, 563 (1970). Abstract. Francesca Ferlaino, Rudolf Grimm, "Trend: Forty years of Efimov physics: How a bizarre prediction turned into a hot topic". Physics, 3, 9 (2010). Full Article. 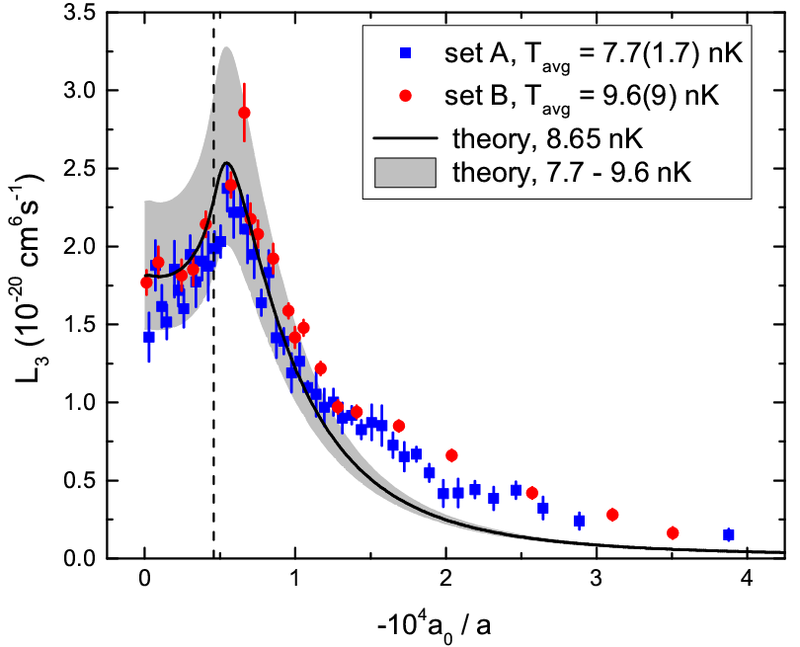 T. Kraemer, M. Mark, P. Waldburger, J. G. Danzl, C. Chin, B. Engeser, A. D. Lange, K. Pilch, A. Jaakkola, H.-C. Nägerl, R. Grimm, "Evidence for Efimov quantum states in an ultracold gas of caesium atoms". Nature, 440, 315 (2006). Abstract. Cheng Chin, Rudolf Grimm, Paul Julienne, Eite Tiesinga, "Feshbach resonances in ultracold gases". Review of Modern Physics, 82, 1225 (2010). Abstract. B. D. Esry, Chris H. Greene, and James P. Burke, Jr., "Recombination of Three Atoms in the Ultracold Limit". Physical Review Letters, 83, 1751 (1999). Abstract. Bo Huang, Leonid A. Sidorenkov, Rudolf Grimm, Jeremy M. Hutson, "Observation of the Second Triatomic Resonance in Efimov’s Scenario". Physical Review Letters, 112, 190401 (2014). Abstract. Martin Berninger, Alessandro Zenesini, Bo Huang, Walter Harm, Hanns-Christoph Nägerl, Francesca Ferlaino, Rudolf Grimm, Paul S. Julienne, and Jeremy M. Hutson, "Feshbach resonances, weakly bound molecular states, and coupled-channel potentials for cesium at high magnetic fields". Physical Review, A 87, 032517 (2013). Abstract. 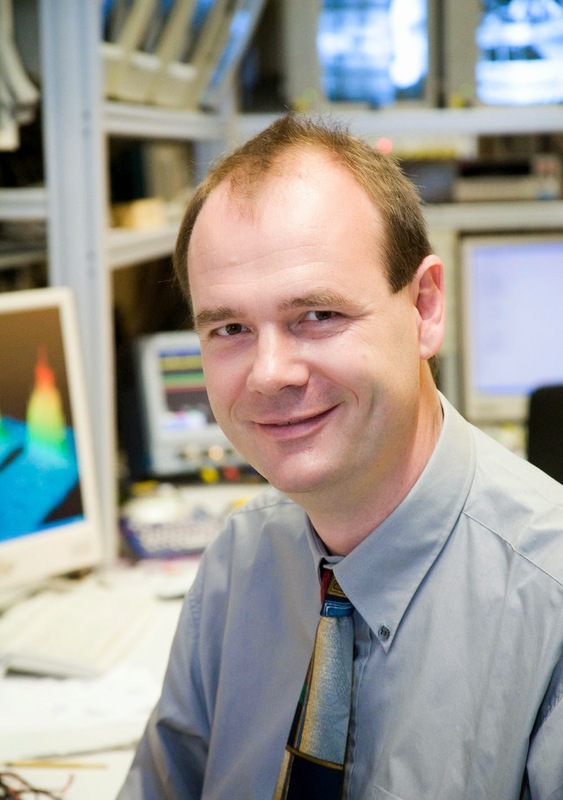 B. S. Rem, A. T. Grier, I. Ferrier-Barbut, U. Eismann, T. Langen, N. Navon, L. Khaykovich, F. Werner, D. S. Petrov, F. Chevy, C. Salomon, "Lifetime of the Bose Gas with Resonant Interactions". Physical Review Letters, 110, 163202 (2013). Abstract. M. Berninger, A. Zenesini, B. Huang, W. Harm, H.-C. Nägerl, F. Ferlaino, R. Grimm, P. S. Julienne, J. M. Hutson, "Universality of the Three-Body Parameter for Efimov States in Ultracold Cesium". Physical Review Letters, 107, 120401 (2011). Abstract. Michael Jag, Matteo Zaccanti, Marko Cetina, Rianne S. Lous, Florian Schreck, Rudolf Grimm, Dmitry S. Petrov, Jesper Levinsen, "Observation of a Strong Atom-Dimer Attraction in a Mass-Imbalanced Fermi-Fermi Mixture". Physical Review Letters, 112, 075302 (2014). Abstract.